To Cite: Saligheh Rad H, Safari M , Fathi Kazerooni A, Moharamzad Y, Sanei Taheri M. Apparent Diffusion Coefficient (ADC) and First-Order Histogram Statistics in Differentiating Malignant Versus Benign Meningioma in Adults, Iran J Radiol. 2019 ; 16(1):e74324. doi: 10.5812/iranjradiol.74324. 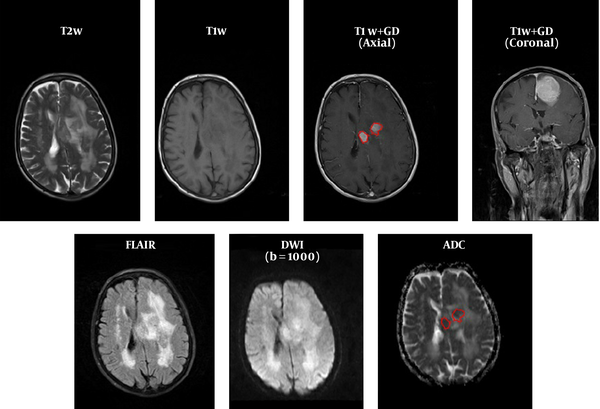 Background: Apparent diffusion coefficient (ADC) measured by diffusion-weighted MRI and first-order histogram (FOH) extracted features, as markers of tumor heterogeneity, have been implicated in differentiating grade of the intracranial tumors. Objectives: To examine whether ADC, normalized ADC (NADC), and FOH features such as entropy, kurtosis, and uniformity can differentiate benign vs. malignant meningioma. Patients and Methods: MRI with diffusion-weighted (DW) imaging sequence of 62 patients with histologically-proven meningioma (37 benign and 25 malignant/atypical) were included. After co-registration of ADC maps to their corresponding anatomical MRI (post-contrast T1-weighted [T1C] images) and delineation of the tumors border by selecting regions of interest (ROIs) on T1C images, a mask of tumor was created and overlaid on the corresponding ADC map. Then, FOH features were extracted. Results: Mean (± standard deviation [SD]) ADC values in benign and malignant subgroups were respectively 1.05 (± 0.23) and 0.99 (± 0.29) 10-3 mm2/s, and P = 0.69. NADC ratios were not statistically significant between benign (0.5 ± 0.09) and malignant (0.5 ± 0.07) meningioma groups (P = 0.89). Mean values of entropy (6.36 vs. 6.44), kurtosis (5.77 vs. 5.45), and uniformity (536.8 vs. 304.18) were comparable between benign and malignant meningioma subgroups. 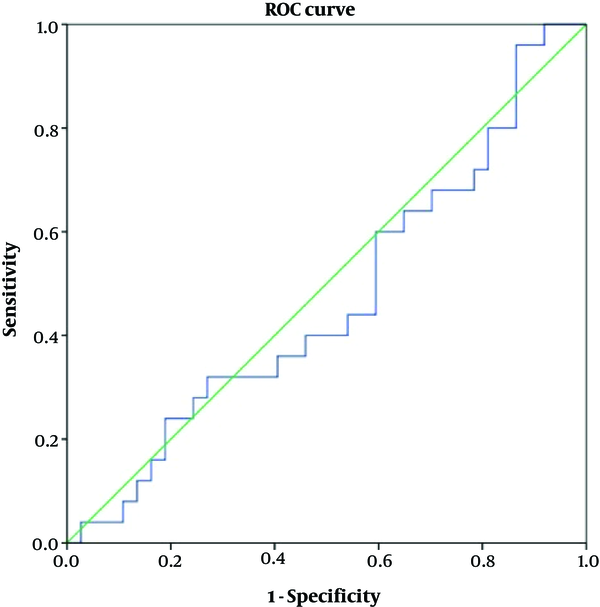 Receiver operating characteristic (ROC) curve analysis did not yield the significant area under the curve results to show acceptable diagnostic accuracy for any of the measured variables. Conclusion: ADC, NADC, and statistical features of tumor heterogeneity by FOH method measured by DW-MRI were not able to differentiate benign vs. malignant/atypical meningiomas. Meningiomas are mainly benign (1), however, 20% of these tumors have aggressive clinical and histopathological behaviors (2). The World Health Organization (WHO) criteria has classified meningioma based on histology into three grades: Grade I (benign or low grade), grade II (atypical), and grade III (anaplastic or malignant) (3). Clinical prognosis is affected by a histological grade of meningioma and the extent of surgical resection. Preoperative knowledge regarding the histological grade of meningioma leads to better tumor resection and even dura substitution in advanced tumors (4). The atypical/malignant tumors are associated with higher recurrence rates, which increase morbidity and mortality (5, 6). Reliable distinction between benign and atypical/malignant meningioma, based on the imaging features of the tumor on conventional MR images, is not possible. Tumor features such as heterogeneous appearance and enhancement, peritumoral edema, and irregular cerebral surface suggest atypical/malignant tumor, however, they are not specific for higher grade tumors (6, 7). Preoperative evaluation and treatment planning of different brain tumors can be made by diffusion-weighted imaging (DWI) and apparent diffusion coefficient (ADC) measurements reliably in a non-invasive manner (7). High cellular tumors demonstrate high signal intensity on DWI and low ADC values (8). Increased cellularity in high-grade tumors decreases the extracellular space, which consequently leads to restriction of water diffusion (9). Atypical and anaplastic meningiomas show lower ADC values compared to low-grade tumors (3). However, the results reported in the literature are controversial about the ability of ADC values in distinguishing low-grade vs. high-grade meningioma (3). In this study, we intended to study ADC and first-order histogram (FOH) feature extraction method in discrimination of histological types (benign vs. malignant) of meningioma. MR images of all patients diagnosed with intracranial meningioma by histopathological examination between August 2015 and January 2016, at our neurologic surgery referral university hospital, were examined. After searching the pathology department database, 62 patients with a mean age of 44 years were included. The histopathological grade of the tumors was determined based on the WHO 2007 classification system for meningioma (10). Based on the histopathology reports, 25 patients had atypical/malignant tumors and 37 had benign meningioma. We excluded the patients with incomplete or low-quality pre-operative MRI and those with previous radiotherapy or radiosurgery. We proposed a multi-parametric framework for meningioma classification. The proposed scheme consisted of four major stages: (1) Co-registration of ADC map to their corresponding anatomical MRI (post-contrast T1-weighted [T1C] images); (2) delineation of the tumor border by selecting regions of interest (ROIs) on T1C images, creating a mask of tumor, and overlaying the mask on the corresponding ADC-maps; (3) feature extraction and selection; and (4) statistical analysis. The overall approach is shown in Figure 1. All patients underwent MR imaging on a 1.5 Tesla system (Siemens®, Avanto, Rel 16.0) using standard head coil. MR images were obtained according to the following tumor protocol in our hospital: Axial and sagittal T1 weighted spin echo (SE) (repetition time [TR]/ echo time [TE] = 400/12 ms), axial and coronal SE T2 weighted images (TR/TE = 3600/97 ms) and axial fluid attenuated inversion recovery images (TR/TE = 4000/117 ms). Diffusion-weighted magnetic resonance imaging echo-planar (DWI-EP) sequence was b values = 800 - 1000. Diffusion-weighted images were performed in the axial plane before the contrast administration, using single-shot multi-slice SE (T2 weighted) echo-planar sequence in 3 orthogonal directions and ADC maps were generated using b-values of 0 and 1000 s/mm2. The following features were obtained in all sequences: A matrix size of 384 ×384, section thickness 5 mm, an inter-slice gap of 1 mm, and field of view of 20 to 24 cm. Post-contrast axial and coronal T1 weighted sequence was performed after intravenous administration of 0.1 mmol gadopentetate dimeglumine per kilogram of body weight. FOH feature extraction method assumes that each pixel is independent from the neighboring pixels. In this method, features are extracted based on gray‐level value of image pixels within the region of interest (ROI). In order to determine the ROI, the whole tumor margin was delineated manually on contrast-enhanced T1-weighted and anatomical spin echo images by a single radiologist blinded about the histopathology of the tumors. ROIs were not placed in peritumoral edema. Then, ADC maps were co-registered to the counterpart T1C images through rigid intra-subject registration with normalize mutual information (NMI) similarity measure and trilinear transformation method using FSL library of analysis tools (Figure 1) (10). As seen in Figure 2, which is an example that depicts the histogram of pixel gray‐levels in the ROI of benign and high-grade tumors, the tumorous region in malignant meningioma is different from the benign tumor; therefore, this difference may help us extract some statistical features to discriminate malignant from benign tumors. The whole tumor mean ADC values were measured at the slice with the largest diameter of the tumor. In order to calculate normalized ADC (NADC) (as ratio of ADC to ADC of the normal white matter), uniform ROI was drawn in the matching normal-appearing white matter of contralateral hemisphere to obtain control ADC values. These features generally indicate the gray level values, contrast, and randomness in tumorous region. As Figure 3 depicts, these parameters, which represent gray level in general, contrast, and randomness are different in malignant and benign classes and it is expected that these features help to discriminate malignant and benign meningiomas. Statistical features extracted included standard deviation, smoothness, third‐moment, uniformity, entropy, kurtosis, and the 25th, 75th, and 95th percentiles of gray level values in tumorous regions. These features are explained in Table 1. Abbreviation: ROI, regions of interest. In order to determine the normal distribution of the variables, a combination of statistical methods including Kolmogorov-Smirnov test, Shapiro-Wilk test, histogram charts, and Quantile-Quantile (Q-Q) plot diagrams were used. The variables with normal distribution were presented as mean (± standard deviation). The non-normal variables were described by median (interquartile range, IQR). To compare normal variables between malignant and benign meningioma groups, student t-test was applied. The Mann-Whitney U test was applied to compare variables with non-normal distribution between the two studied groups. In addition, ROC (receiver operating characteristic) analysis was performed to calculate the accuracy (area under curve), sensitivity, specificity, and positive likelihood ratio of the variables. In all analyses, the significance level was set at 0.05. Institutional review board (IRB) approval and patient informed consent were not required. Mean (± Standard deviation [SD]) ADC values in benign and malignant subgroups were respectively 1.05 (± 0.23) and 0.99 (± 0.29) 10-3 mm2/s, P = 0.69. Similarly, no difference was detected regarding minimum, maximum, and median values of ADC between the two groups. Likewise, NADC ratios were not statistically significant between benign (0.5 ± 0.09) and malignant (0.5 ± 0.07) meningioma groups (P = 0.89); Tables 2 and 3. Abbreviations: ADC, apparent diffusion coefficient; CI, confidence interval. Abbreviation: ADC, apparent diffusion coefficient. a Data are presented as median (interquartile range). There was no statistically significant difference regarding FOH feature extraction between benign and malignant meningioma. Tables 2 and 3 present comparison of variables with normal and non-normal distribution between the two groups. Table 4 shows accuracy of the variables according to the ROC curve analyses. As depicted, none of the variables of ADC or FOH showed acceptable accuracy to discriminate benign from malignant meningiomas (Figures 4 and 5). Table 5 shows optimal cut-off points with respected sensitivity, specificity, and positive likelihood ratios of the studied variables to differentiate malignant from benign meningioma. None of the variables had acceptable sensitivity and specificity to differentiate benign from malignant meningioma (Figures 6 and 7). Abbreviations: ADC, apparent diffusion coefficient; CI, confidence interval; ROC, receiver operating characteristic. Abbreviations: His, Histogram; ADC, apparent diffusion coefficient. Here, we intended to determine the diagnostic accuracy of ADC, NADC, and FOH extraction features in differentiating benign from malignant meningioma in adult patients. Our findings showed that neither ADC value nor NADC values were able to differentiate benign vs. malignant meningioma with a reliable sensitivity and specificity. MRI (conventional or advanced sequences) has gained attention in predicting not only the benign vs. malignant nature of intracranial tumors but also in determining the grade of such tumors (11). ADC, measured using diffusion-weighted imaging sequence, has been studied previously in predicting the histological nature of brain tumors (9, 12, 13). ADC, which is calculated automatically by software shows the magnitude of water molecules diffusion. In tumors with high proliferation of tumoral cells, the diffusivity of water molecules reduces. Therefore, owing to his effect, an inverse correlation has been reported between ADC value and tumor cellularity (14). This observation has gained more attention in intracranial tumors. However, controversy is still present in the literature, which to what extent ADC values can be relied upon to differentiate benign and malignant brain tumors. Here, we decided to study ADC values in meningioma, which along with gliomas are deemed to be the most common histologically diagnosed primary intracranial tumors. In addition to ADC values, another important item measured in the studies is the normalized value of ADC, which is a ratio of the tumor ADC to normal white matter ADC. The NADC ratio is usually calculated to compensate for possible variations in ADC values yielded by different diffusion weighted imaging sequences. Generally, NADC values lower than 1.0 represent restricted water diffusion (9). Some studies reported that these two values are useful in reliable prediction of meningioma grade (7, 9, 15-17), however, others did not report such finding (6, 18, 19). For instance, a value of 0.80 × 10-3 mm2/s for ADC was able to differentiate atypical/malignant meningioma from benign meningioma in a study recruiting 25 atypical/malignant and 23 benign meningiomas (9). According to our findings, even though mean ADC value in malignant subgroup (0.99) was lower than that of seen in the benign group (1.05), this difference did not reach a statistical significance. Here, mean NADC in both groups were lower than 1.0, which reflects high cellularity. However, from the statistical view, no difference was observed between benign and malignant meningiomas. Another similar study involving 135 benign and 42 patients with higher grade meningiomas (37 atypical and 5 malignant), in agreement with our results, reported a mean ADC value of 0.99 in benign meningioma and 0.84 in malignant meningioma, with no significant difference (6). Presence of necrosis in the tumors and different places of ROI measurement are some of the probable reasons responsible for this controversy mentioned in the literature (4, 6). Besides meningioma, ADC has not been found useful in differentiating brain lymphoma from metastases (12). An advantage of the current study compared to previous reports is that we also investigated concurrently the diagnostic accuracy of FOH features. Compared to ADC, these histogram features have not been studied sufficiently in meningioma. Histograms, which show pixels in an image with similar intensity at a defined intensity level, provide statistical information regarding the heterogeneity of a tumor (20). Similar to ADC and NADC, none of the statistical indices showed significant difference between benign and malignant meningiomas. The histogram has been studied in a previous study and the 98th percentile was found to be the most significant feature in distinguishing higher grade gliomas from lower grade ones (21). Uniformity, which was lower in malignant meningioma, is a quantitative feature, which measures the degree of homogeneity of ROI. Heterogeneous enhancement after gadolinium administration is one of the traits of high-grade meningiomas, which is attributed to non-uniform distribution of cells or ischemic necrosis (2, 4). On the other hand, benign tumors are more homogenous compared to malignant types. Our results are compatible with these findings. Standard deviation was a valuable feature found not to differentiate malignant from benign meningioma. The ROI contrast, which measured by standard deviation quantitatively, was significantly higher in malignant meningiomas than in benign types. As seen in Figure 2, the shape of malignant meningioma histogram was different and wider than benign meningiomas, which reflect the much wider standard deviation in gray levels of malignant tumors. The 75th and 95th percentile of gray level values were the other features, which significantly differentiated meningioma types, especially the 95th percentile of gray level values in this method. In conclusion, based on the analyses, none of the FOH statistics were significantly different between malignant and benign meningioma group. As cell heterogeneity is a characteristic of malignant cells, efforts have been done to measure this heterogeneity using FOH statistics such as smoothness, kurtosis, and entropy. However, our results showed that FOH was not reliable in differentiating benign from malignant meningioma. Authors' Contributions: Conception: Hamidreza Saligheh Rad, Morteza Sanei Taheri; drafting and analyses: Yashar Moharamzad, Mojtaba Safari; data acquisition: Anahita Fathi Kazerooni, Mojtaba Safari; critical revision: Morteza Sanei Taheri. Ethical Considerations: Institutional review board (IRB) approval and patient informed consent were not required. 1. Azizyan A, Eboli P, Drazin D, Mirocha J, Maya MM, Bannykh S. Differentiation of benign angiomatous and microcystic meningiomas with extensive peritumoral edema from high grade meningiomas with aid of diffusion weighted MRI. Biomed Res Int. 2014;2014:650939. doi: 10.1155/2014/650939. [PubMed: 25478572]. [PubMed Central: PMC4248374]. 2. 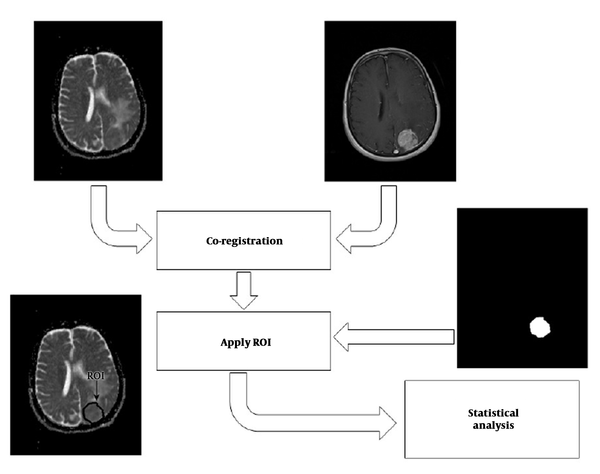 Liu Y, Chotai S, Chen M, Jin S, Qi ST, Pan J. Preoperative radiologic classification of convexity meningioma to predict the survival and aggressive meningioma behavior. PLoS One. 2015;10(3). e0118908. doi: 10.1371/journal.pone.0118908. [PubMed: 25786236]. [PubMed Central: PMC4364713]. 3. Tang Y, Dundamadappa SK, Thangasamy S, Flood T, Moser R, Smith T, et al. Correlation of apparent diffusion coefficient with Ki-67 proliferation index in grading meningioma. AJR Am J Roentgenol. 2014;202(6):1303-8. doi: 10.2214/AJR.13.11637. [PubMed: 24848829]. 4. Lin BJ, Chou KN, Kao HW, Lin C, Tsai WC, Feng SW, et al. 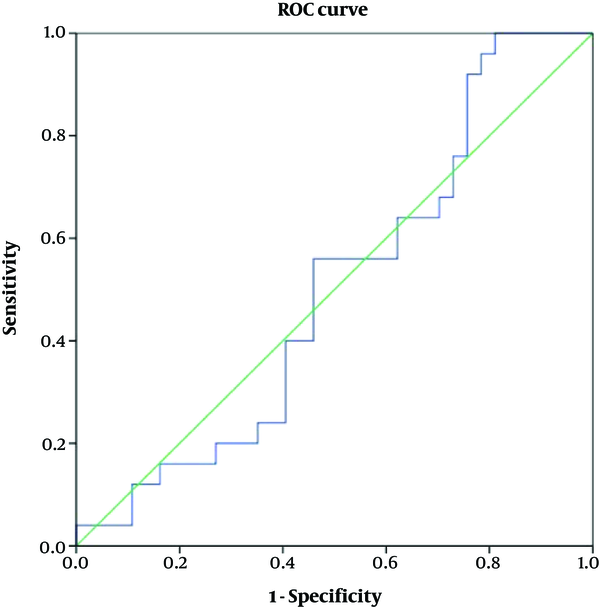 Correlation between magnetic resonance imaging grading and pathological grading in meningioma. J Neurosurg. 2014;121(5):1201-8. doi: 10.3171/2014.7.JNS132359. [PubMed: 25148010]. 5. Filippi CG, Edgar MA, Ulug AM, Prowda JC, Heier LA, Zimmerman RD. Appearance of meningiomas on diffusion-weighted images: Correlating diffusion constants with histopathologic findings. AJNR Am J Neuroradiol. 2001;22(1):65-72. [PubMed: 11158890]. 6. Sanverdi SE, Ozgen B, Oguz KK, Mut M, Dolgun A, Soylemezoglu F, et al. Is diffusion-weighted imaging useful in grading and differentiating histopathological subtypes of meningiomas? Eur J Radiol. 2012;81(9):2389-95. doi: 10.1016/j.ejrad.2011.06.031. [PubMed: 21723681]. 7. Bano S, Waraich MM, Khan MA, Buzdar SA, Manzur S. Diagnostic value of apparent diffusion coefficient for the accurate assessment and differentiation of intracranial meningiomas. Acta Radiol Short Rep. 2013;2(7):2.0479816135125E+15. doi: 10.1177/2047981613512484. [PubMed: 24349716]. [PubMed Central: PMC3863968]. 8. Voultsinou D, Matis GK, Chrysou OI, Birbilis TA, Cheva A, Geroukis T. An atypical meningioma demystified and advanced magnetic resonance imaging techniques. J Cancer Res Ther. 2014;10(2):387-9. doi: 10.4103/0973-1482.136666. [PubMed: 25022401]. 9. Nagar VA, Ye JR, Ng WH, Chan YH, Hui F, Lee CK, et al. Diffusion-weighted MR imaging: Diagnosing atypical or malignant meningiomas and detecting tumor dedifferentiation. AJNR Am J Neuroradiol. 2008;29(6):1147-52. doi: 10.3174/ajnr.A0996. [PubMed: 18356472]. 10. Smith SM, Jenkinson M, Woolrich MW, Beckmann CF, Behrens TE, Johansen-Berg H, et al. Advances in functional and structural MR image analysis and implementation as FSL. Neuroimage. 2004;23 Suppl 1:S208-19. doi: 10.1016/j.neuroimage.2004.07.051. [PubMed: 15501092]. 11. Moharamzad Y, Sanei Taheri M, Niaghi F, Shobeiri E. Brainstem glioma: Prediction of histopathologic grade based on conventional MR imaging. Neuroradiol J. 2018;31(1):10-7. doi: 10.1177/1971400917743099. [PubMed: 29148317]. [PubMed Central: PMC5789999]. 12. Server A, Kulle B, Maehlen J, Josefsen R, Schellhorn T, Kumar T, et al. Quantitative apparent diffusion coefficients in the characterization of brain tumors and associated peritumoral edema. Acta Radiol. 2009;50(6):682-9. doi: 10.1080/02841850902933123. [PubMed: 19449234]. 13. Yin B, Liu L, Zhang BY, Li YX, Li Y, Geng DY. Correlating apparent diffusion coefficients with histopathologic findings on meningiomas. Eur J Radiol. 2012;81(12):4050-6. doi: 10.1016/j.ejrad.2012.06.002. [PubMed: 22727725]. 14. Chen L, Liu M, Bao J, Xia Y, Zhang J, Zhang L, et al. The correlation between apparent diffusion coefficient and tumor cellularity in patients: A meta-analysis. PLoS One. 2013;8(11). e79008. doi: 10.1371/journal.pone.0079008. [PubMed: 24244402]. [PubMed Central: PMC3823989]. 15. Hakyemez B, Yildirim N, Gokalp G, Erdogan C, Parlak M. The contribution of diffusion-weighted MR imaging to distinguishing typical from atypical meningiomas. Neuroradiology. 2006;48(8):513-20. doi: 10.1007/s00234-006-0094-z. [PubMed: 16786348]. 16. Surov A, Gottschling S, Mawrin C, Prell J, Spielmann RP, Wienke A, et al. Diffusion-weighted imaging in meningioma: Prediction of tumor grade and association with histopathological parameters. Transl Oncol. 2015;8(6):517-23. doi: 10.1016/j.tranon.2015.11.012. [PubMed: 26692534]. [PubMed Central: PMC4700293]. 17. Surov A, Ginat DT, Sanverdi E, Lim CC, Hakyemez B, Yogi A, et al. Use of diffusion weighted imaging in differentiating between maligant and benign meningiomas. A multicenter analysis. World Neurosurg. 2016;88:598-602. doi: 10.1016/j.wneu.2015.10.049. [PubMed: 26529294]. 18. Santelli L, Ramondo G, Della Puppa A, Ermani M, Scienza R, d'Avella D, et al. Diffusion-weighted imaging does not predict histological grading in meningiomas. Acta Neurochir (Wien). 2010;152(8):1315-9. discussion 1319. doi: 10.1007/s00701-010-0657-y. [PubMed: 20428902]. 19. Cabada T, Caballero MC, Insausti I, Alvarez de Eulate N, Bacaicoa C, Zazpe I, et al. [The role of diffusion-weighted imaging in the evaluation of meningiomas: Radio-pathologic correlation]. Radiologia. 2009;51(4):411-9. doi: 10.1016/j.rx.2009.01.017. [PubMed: 19552929]. 20. Just N. Improving tumour heterogeneity MRI assessment with histograms. Br J Cancer. 2014;111(12):2205-13. doi: 10.1038/bjc.2014.512. [PubMed: 25268373]. [PubMed Central: PMC4264439]. 21. Jung SC, Yeom JA, Kim JH, Ryoo I, Kim SC, Shin H, et al. 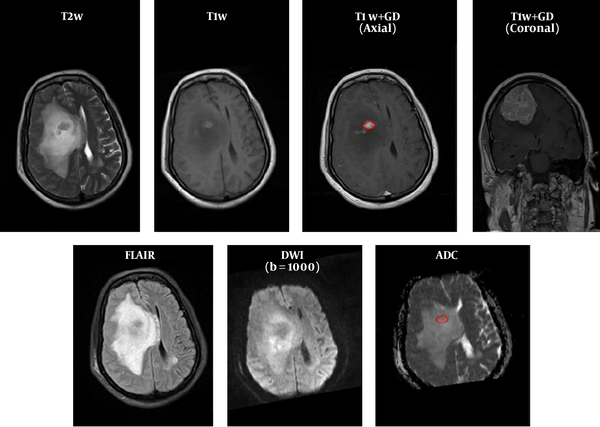 Glioma: Application of histogram analysis of pharmacokinetic parameters from T1-weighted dynamic contrast-enhanced MR imaging to tumor grading. AJNR Am J Neuroradiol. 2014;35(6):1103-10. doi: 10.3174/ajnr.A3825. [PubMed: 24384119].